I’ve received a good response regarding my blog post on Friday, “Green crabs entrenched at Dungeness Spit, but new issues are emerging,” which covered a variety of issues — from where the invasive crabs did NOT come from to new detection methods for invasive species. I heard some legitimate questions about how to identify European green crabs and what to do if you find one. The main thing is to get a photograph and send it to the Washington Sea Grant Crab Team, which is leading the war on green crabs. I’m reminded that it is illegal to possess a green crab without a permit. I’m also pleased to see the announcement of a free online webinar on July 10 to help people identify European green crabs. The two-hour “First Detector Training Webinar” is co-sponsored by the Crab Team and Washington Invasive Species Council. Register ahead of time to get information about the event. Coconut crabs are giant land-based crustaceans that can grow to 3 feet wide, claw-to-claw. The crabs, frightening to some, inhabit islands in the Pacific and Indian oceans. These crabs, which grow larger than any other land-based arthropod, are known for their uncanny strength. They get their name from an ability to break through coconut husks with their powerful claws. They can also break a lot of other things, as revealed in a variety of amusing videos, some of which I’ve posted on this page. Coconut crabs became a topic of discussion among scientists last month when a group of Japanese researchers reported that they had measured the strength in the legs and claws of coconut crabs. They found that these crabs could lift four times their weight, and their pinching power was greater than that of any other kind of crab, even greater than the jaw strength of terrestrial predators. The report was published in the online journal Plos One. 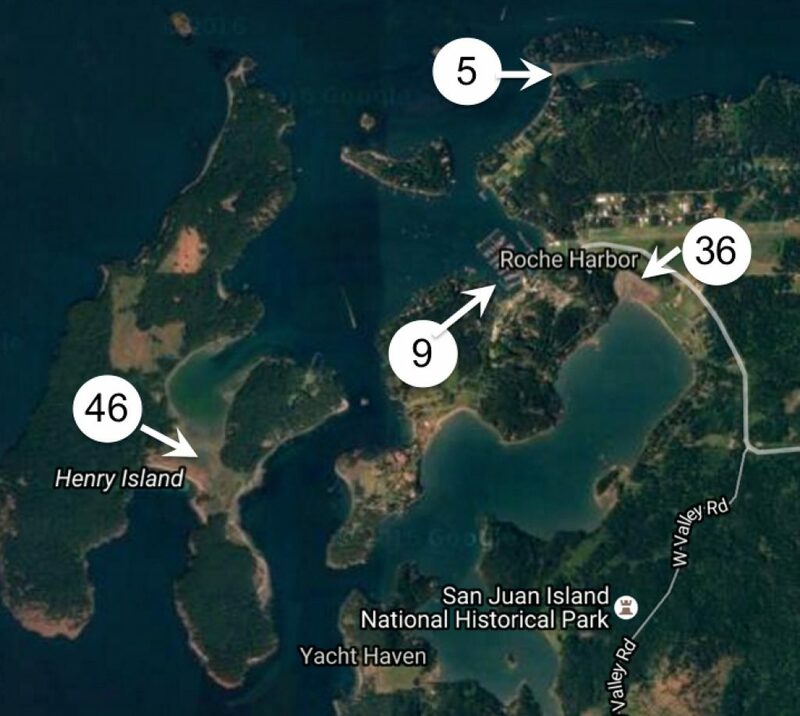 No European green crabs were caught this week during an intensive two-day trapping program designed to see if any of the invasive crabs have gained a foothold in the San Juan Islands. If you recall, a single adult green crab was trapped Aug. 31 by a team of volunteers in the San Juan Islands. It was the first green crab ever found in Puget Sound, but experts have been worried about the crab for years. (See Water Ways, Sept. 3.) 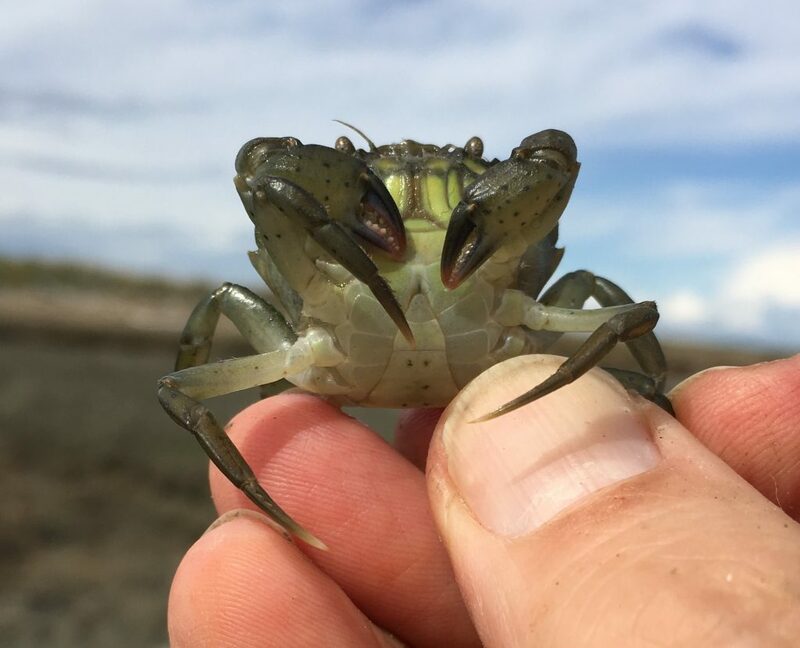 The volunteers are involved in a citizen science monitoring program to locate green crabs when they first arrive in Puget Sound and before they become a breeding population. The response by professional leaders of the Crab Team was to place 97 traps in and around the location where the first crab was found. The effort was started on Monday and repeated on Tuesday. The maps on this page show the locations and the number of traps place at site on the two days. Hundreds of native crabs were trapped and inspected, but no green crabs were found. Although no live crabs were found, one molt (cast-off shell) from a green crab was found by Jeff Adams, a marine ecologist for Washington Sea Grant who manages the Crab Team of volunteers. The molt was close to where the live crab was found. The experts have not determined if the molt came from the first crab or if there might be other crabs in the area. The next step is still being planned. 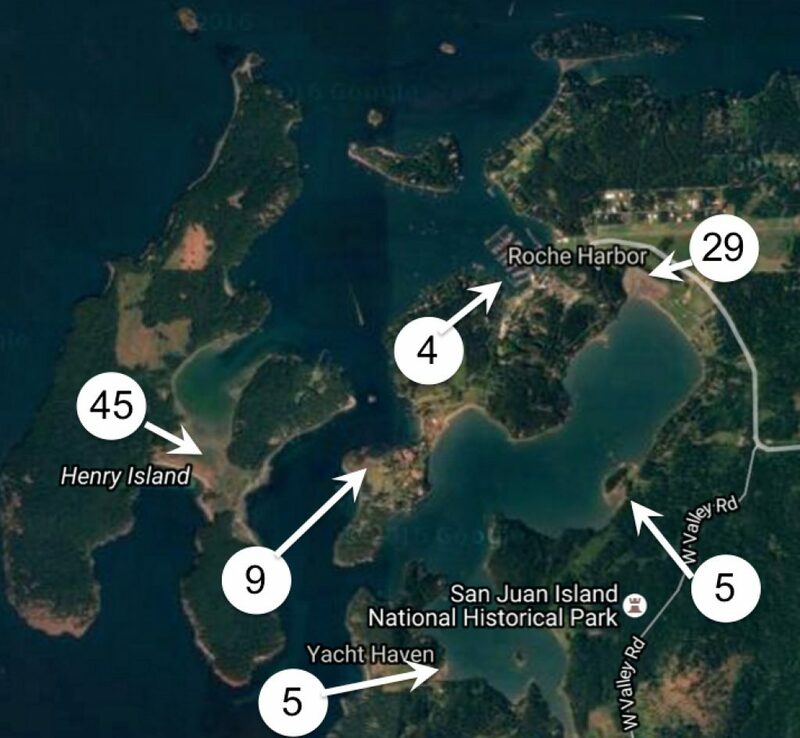 It could involve another intensive trapping effort, perhaps in the spring, as well as increasing the number of volunteer trapping sites in the San Juan Islands. The volunteer program takes a hiatus in the winter, when the crabs are less active, but it will resume in the spring. The next green crab training program is scheduled for March, when new and former citizen science volunteers will be taught how to identify green crabs and conduct an effective trapping effort in up to 30 locations throughout Puget Sound. To learn more about the volunteer program, check the Washington Sea Grant webpage “Get Involved” or sign up for a free email newsletter called “Crab Team News” (click “Newsletters”). You may want to review my recent writing project on invasive species for the Encyclopedia of Puget Sound, including a story about green crabs and the volunteer monitoring program. Those interested in the creatures that inhabit our local waterways may find themselves enthralled by two recent publications — one describing the many species of fish found in the Salish Sea and the other examining the lifestyles of crabs and shrimps living along the Pacific Coast. 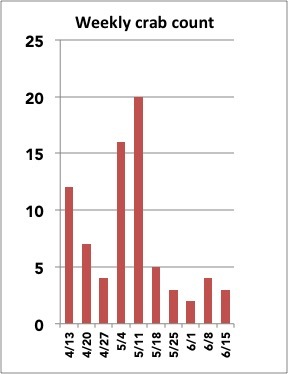 The new fish report (PDF 9.2 mb), published by NOAA Fisheries, documents 253 species found in the Salish Sea, including 37 additional species not listed in the previous comprehensive fish catalog, now 35 years old. What caught my immediate attention in the report were the beautiful illustrations by Joe Tomelleri, who has spent the past 30 years capturing the fine features of fish from throughout the world. 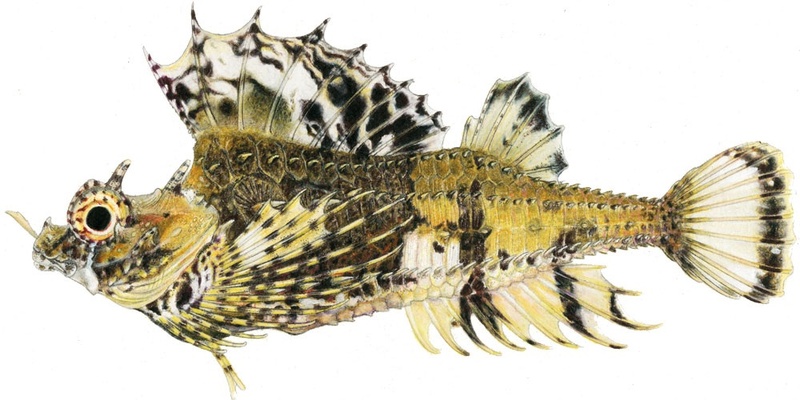 Check out the ornate fins on the fourhorn poacher and the muted colors of the spotted ratfish. I never realized that common ratfish wwere so beautiful. The new report offers a preview of a much-anticipated book by Ted Pietsch, retired fish curator at the University of Washington’s Burke Museum, and Jay Orr, a biologist at NOAA’s Alaska Fisheries Science Center. The book, “Fishes of the Salish Sea,” will provide extensive descriptions as well as illustrations of all known species — including some early discoveries that came to light after publication of the new NOAA report. The book could be 600 pages or more. I interviewed author Ted Pietsch of Seattle and illustrator Joe Tomelleri of Leawood, Kans., for a piece incorporated into the Encyclopedia of Puget Sound. 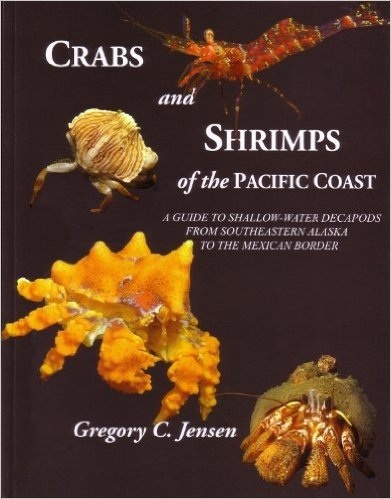 The other book, “Crabs and Shrimps of the Pacific Coast” by Greg Jensen of Bremerton, pulls together information about 300 of these various crustaceans. The book, which has been on my review list for more than year, has won acclaim from experts in the field as well as casual observers of nature. The book comes with an associated computer disc of the book’s text, which allows one to link to other articles and reports. One can also load much of the book onto a smart phone, which can be taken to the shoreline and used as a field guide. “My goal was to make a book that would appeal to someone who just wants to learn about this stuff and would also be valuable to someone, like myself, who is a specialist in the field,” Greg told me. I enjoy Greg’s light writing style, as he tells little stories in sidebars, shares brief biographies of key scientists and clears up myths and confusion. One sidebar, for example, tells us that the lines between shrimp and prawns have become blurred. In Great Britain, he said, Crangonids, “with their stout, somewhat flattened form, were called ‘shrimp,’ while palaemonids were known as prawns.” In other places, prawns are considered larger than shrimp. 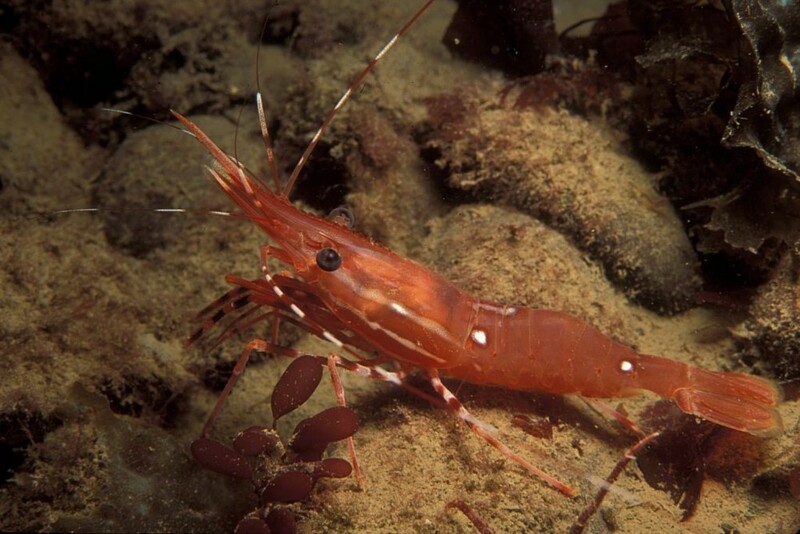 Sometimes prawns refer to freshwater versus saltwater species. “Bottom line: There is no formal definition separating the two. Like the Queen’s English, once they left home for America and Australia, they became bastardized beyond recognition,” he wrote. Greg, a scuba diver, shot about 90 percent of the pictures shown in the 240-page book. If nothing else, he told me, the book provided an excuse for him to dive in waters all along the coast. Like Ted Pietsch has done for fish, Greg has gone back to the original references about crabs and shrimp, taking pains to correct mistakes passed down through scientific literature. It has taken years to track down the many references to ensure accuracy and give credit to the right people, he said. Greg, who grew up in Bremerton, was in grade school when a field trip took him to Agate Passage on a low tide, where he became intrigued by crabs. He soon started an extensive collection of dried crab shells. Looking back, Greg credits marine biology instructors Ted Berney at East High School and Don Seavy at Olympic College for helping him pursue his interests, eventually launching his career at the University of Washington. Today, Greg still lives in Bremerton, researching, writing and teaching at the UW School of Aquatic and Fishery Science. The book can be purchased directly from Greg Jensen, from Amazon and from Reef Environmental Education Foundation. In recognition of what ought to be a great summer of crabbing on Puget Sound, I’ve compiled a variety of crab-related videos. In the video player at right, you’ll learn about The Crabman, Brodie Anderson, a brave young man who communes with nature by catching crabs and talking to them. 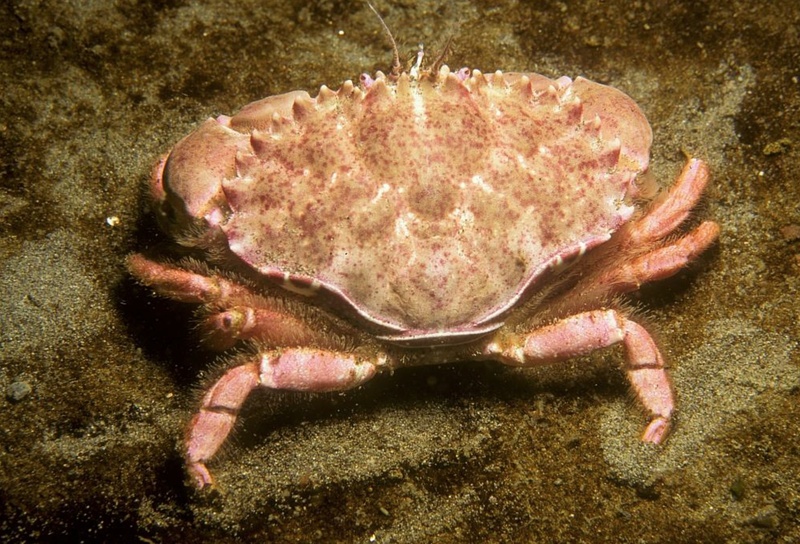 Ever wonder how crabs act as they approach a crab pot sitting on the bottom of Puget Sound? What are they thinking as they partake of the goodies inside the trap? How do they feel when they realize they can’t get out? OK, maybe we won’t get answers to all these questions, but you can learn a lot from this time-lapse video (below) taken off Camano Island by Squire Productions. For more info on crabbing in Puget Sound, begin with the news release by the Washington Department of Fish and Wildlife. In a series of rather odd videos, actor Patrick Duffy carries on discussions with a friend, who just happens to be a crab. My favorite is his conversation about “American Idol.” I always wondered if a singer prefers to be called “pitchy” if he or she is off-key or misses a few notes. Another classic battle is the crab versus the millipede, a battle that seemingly never ends. There is no entanglement at all in this skirmish between a crab and a Dachshund puppy. Crabs are famous for their mass movements of molting and mating, as shown in these videos from Australia and Cuba. All this should give you something to think about when you’re pulling in that crab pot.